How does the yield curve look? What has changed this month? In this article, I'll review the fixed-to-floating rate preferred stocks and units, sorted into several categories. There are 85 issues in our database that trade on primary exchanges. Maybe the most important ETF for this type of security is the Invesco Variable Rate Preferred ETF (VRP). 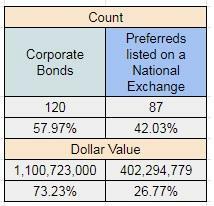 As we can see in the charts below, despite the fact that almost 60% of the holdings are corporate bonds, which occupies 3/4 of the market capitalization of the fund, still, with $400M in preferred stocks, VRP has no analog in regard to floating rate securities. However, when we are talking about fixed-income ETFs, the influence of the iShares U.S. Preferred Stock ETF (PFF), the Invesco Financial Preferred Portfolio ETF (PGF), and the Invesco Preferred Portfolio ETF (PGX) should not be underestimated, as with a total of $20B of preferred stocks and baby bonds, they are the benchmark of this market. I'll just remind you about last year's rally in fixed-income borne from the redemption of the two "giants" HSEA and HSEB and the released cash of over a billion dollars used from PFF, PGF, and PGX to buy more of the rest of its holdings. We are continuously monitoring all preferred stocks by several groups and will reinstate our Monthly Review, publishing a recap of the groups of interest. First, let's take a look at the main indicators that we follow and their behavior during the last month. The most essential thing for fixed-income investors for the past month is that TNX has fallen below the 2.5% yield mark. Supported by the dramatically downgraded Federal Reserve expectations on the rate path, released by the Fed last month, followed by the dovish-than-expected Fed Chair speech at the press conference, the Treasury yields have settled at their 1-year low. The fixed-income securities, as we can see in the second chart, are in a bull market since the start of the year. The Variable Rate Preferred ETF, VRP, has risen 10% from its December 2018 lows. As for the equity markets, they had entered into a bear market and the S&P 500 recorded its worst December since 1931, everything seems to be behind us. Furthermore, investors may be happy with the New Year's rally and the S&P 500 trading close to its all-time high at the time of the US and China trade war tensions, the slowing economic growth and the Brexit mess. Here, I will post the Yield Curve for all that are probably redemptions in the next 10 years. The point here is that their Yield-to-Call is the best you can get out of them, because after they become floating, they also become redeemable, which pins their price to par after their call date. If the stock trades higher than its par plus accrued dividend after the call date, it will have a negative Yield-to-Call, and to have such an expectation is financially unreasonable. Here is a close view of all high-quality financial preferreds, most of them are capped between 4% and 5.5%. This is a 0.50-1.00% (↓) shift of the yield curve since our previous article in February. For a better perspective, I'll remove RY-T from the next two charts. They all pay a non-qualified dividend rate. The average Yield-to-Call of this group is sitting at a rate of 7.60% ( a 0.60% (↓) shift of the yield curve since the February article). This is a list of the Shipping, Energy related and other high-yield preferred stocks, with an average Yield-to-Call of an 11.70% (a shift of 0.40% (↓) for a month). Which fixed rate preferred stocks are ex-dividend until the end of the month? The date given is predicted on the basis of the previous ones and may vary by a few days. The ex-dividend dates are very useful for every fixed-income investor that practices the dividend capture strategy. 7. How do they move? This is what our small world of fixed-to-floating rate preferred stocks looks like at the start of April. After the New Year's rally, I am not finding that many bargains at the moment. My portfolio is almost flat and personally, I prefer to wait for some correction and better entry opportunities if there are any mispriced stocks. Note: This article was originally published on April 8, 2019, and some figures and charts may not be entirely up to date. The Trade With Beta team has been submerged in the universe of preferred stocks and baby bonds for almost a decade, and we decided to share our knowledge and expertise through the inception of this service. We attempt to cover all aspects of these products, from IPOs to pair trades and portfolio picks and, last but not least, issues. Additionally, once a month we go through all different groups of fixed-income instruments to make sure that nothing has gone unnoticed.